Josh Henderson is the award winning Executive Chef and founder of the acclaimed Huxley Wallace Collective. 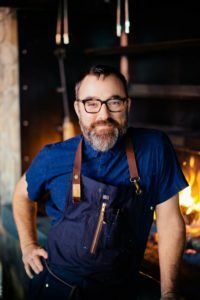 Known as a visionary and food entrepreneur, Josh has spent his career cooking in kitchens and unique locations across the country, more recently establishing a group of highly successful restaurants in the Pacific Northwest. Properties he has led from concept to execution include: Westward, a contemporary water-inspired restaurant, bar, and oyster bar located on the shores of Lake Union; fan favorite Quality Athletics, a full service sports bar and restaurant located in Seattle’s Pioneer Square; Great State Burger, a take on the classic burger joint serving grass-fed organic beef, organic milk shakes, Yukon Gold crinkle cut fries, fresh American cheese, lettuce and tomato; Bar Noroeste, a taqueria serving a progressive and edgy style of booze friendly food – favorites you’d expect with a unique twist, and the unexpected in a simple, approachable style; Saint Helens, an American style brasserie located along the Burke Gilman trail in the Laurelhurst neighborhood; Vestal, the home of sorts for chef Josh, centered around a vast chef’s counter surrounding a wood-fired hearth; Poulet Galore, a rotisserie chicken takeout counter serving chickens, sandwiches, salads, sides and sipping broths; and Cantine, a breakfast and lunch spot with house-made meals and snacks by day and a casual beer bar with local drafts, buck-style cocktails, and house-made snacks by night. 2017 will welcome Kiki Ramen, a South Lake Union ramen bar offering classic ramen favorites, sides, and a full service sake and cocktail bar. In 2007 Josh developed and grew the Skillet Group before stepping away in 2013. Josh is leading five new restaurant concepts set to open in 2016, including his new home base Vestal, located in Seattle’s vibrant South Lake Union. Josh received the Star Chefs Rising Star Award in 2009, was named the most influential person of 2010 by Seattle Magazine, and was recognized in Puget Sound Business Journal’s 2012 top 40 under 40. He is actively involved in the food world, leading discussions locally and across the country, and participating in events as highlighted chef or food expert. Josh is also involved in supporting a number of local and national nonprofit organizations including the No Kid Hungry campaign based out of Washington DC. He published his first cookbook in July 2012, The Skillet Cookbook – A Streetfood Manifesto.